God never intended for you to do life alone but to do life together in community. 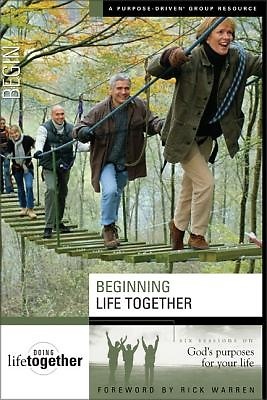 This introductory group study, Beginning Life Together, gives you an overview of the five biblical purposes that God intends for living together in community. This study will take you on a 6-week journey through these five purposes and give you a taste of the life God created you to live. Based on the five biblical purposes that form the bedrock of the Saddleback Church, Doing Life Together will help your group discover what God created you for and how you can this that dream into an everyday reality. Experience the transformation firsthand as you begin Connecting, Growing, Developing, Sharing, and Surrendering your life together for him.